This project showcases [Nina's] exquisite playing style, which is simultaneously delicate, exuberant, soulful, and joyful. The recording quality is excellent, and captures all the subtle nuances of Nina's expressive style of playing, including her masterful use of harmonics and bends. ...there is a ton of inspiration here for anyone trying to make a solo instrument sound really full and rich. I've done my share of reviewing CDs and this is among the best I can remember. ...it's as if a whole bunch of little robed creatures are standing on the dulcimer strings and singing a cappella--and, in the case of the faster pieces, jumping up and down and dancing! Bravissima! The whole CD is positively stunning. Such wonderful and moving melodies...and technically amazing! From Shaker to Shape Note tunes and O'Carolan to Spirituals and Hymns, some of the best fingerpicking I have ever heard. 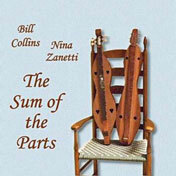 "The Sum of the Parts"
A solo CD, featuring quiet, contemplative music for the midwinter season. The play list includes several well-known Christmas carols, as well as less familiar tunes from a wide variety of traditions, among them Shaker music, shape-note tunes, spirituals, a Spanish gypsy carol. The overall theme is a gentle celebration of light shining during any dark winter of the soul. 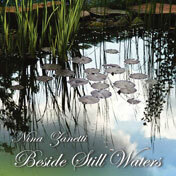 Nina’s first solo album, featuring arrangements for standard and baritone dulcimer. Enjoy Nina’s distinctive finger-style playing along with a few delightful surprises. The CD includes 66 minutes of music on 19 tracks. 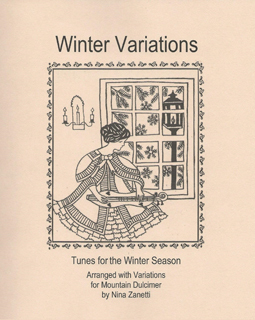 Features solos and duets played on standard, baritone, and bass dulcimers. Recorded and engineered by Neal Walters, the CD includes 70 minutes of music on 22 tracks. 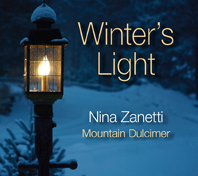 Winter Variations is a companion book to Nina's Winter's Light CD. Like the CD, the book includes selections chosen to celebrate the quiet joys and consolations of the winter season. Most of the tunes on the CD appear in the book; arrangements range from well-loved seasonal favorites to less familiar carols from a wide range of traditions, including European carols, Shaker music, shape-note tunes, and spirituals. Within the book, each tune is presented in at least two different versions ("variations"): the first version of each set presents a simple arrangement for less-experienced players; subsequent versions increase in complexity and more closely resemble the recorded arrangements. The book also includes a background seciont, wih history of the tunes, lyrics, and helpful playing tips. Tuning mostly DAD (some with capo), and some DGD. Tunes include: O Come, O Come Emmanuel (3 versions); 'Twas in the Moon of Wintertime (3 versions); The Angel Gabriel(3 versions); What Child is This (3 versions); In the Bleak Midwinter (4 versions); When Christ was of a Virgin Born (3 versions); Once in Royal David's City (3 versions); Rise Up, Shephers and Follow (3 versions); Go Tell It on the Mountain (3 versions); The Friendly Beasts (4 versions); Come, All Ye Shepherds (3 versions); Children of the Heavenly Father (4 versions); Infant Holy, Infant Lowly (3 versions); Tu Scendi Dalle Stella (3 versions); Star in the East (3 versions); Cradle Hym (Restoration) (2 versions); The Shepherd's Star (3 versions); Jesus, Jesus, Rest Your Head (3 versions); Silent Night (3 versions). 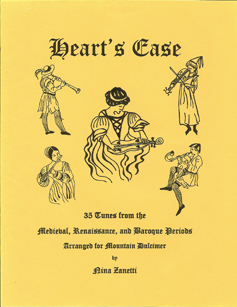 Heart's Ease covers a wide range of periods and styles of "early music," including plainchant, madrigals, chorale preludes, troubadour songs, French chansons, and dance tunes. Some of the selections are traditional; others are by famous composers such as Morley, Dowland, Purcell, and Bach; and the book concludes with eight tunes from Playford's The English Dancing Master. The book also includes background information on the history of the tunes, lyrics, and tips for playing. Most of the arrangements are aimed for intermediate-level players, but a few tunes are presented with multiple versions to accommodate different skill levels and styles. Tunes are mostly in DAD tuning, with a few in DGD or DAC. The collection includes some familiar favorites, such as "Greensleeves," "In Dulci Jubilo," and "To Drive the Cold Winter Away." Other selections may be unfamiliar, but provide a broad sampling of the diverse types of early music that can be enjoyed on mountain dulcimer. 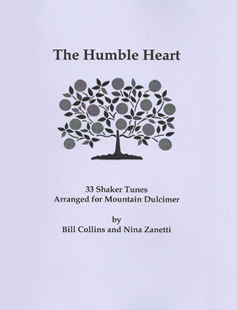 The Humble Heart: 33 Shaker Tunes Arranged for Mountain Dulcimer. 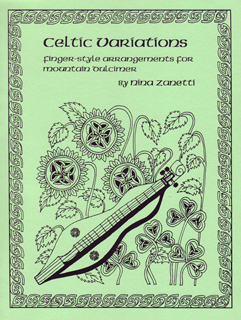 Bill Collins and Nina Zanetti have collaborated on a mountain dulcimer tab book of Shaker music. Drawing on their longstanding, shared interest in Shaker music, Bill and Nina have created arrangements for 33 lovely Shaker tunes, ranging from solemn, deeply contemplative hymns to lively dance tunes. Most of the arrangements are in DAD; a few use DGD or DAC. The book includes background notes and lyrics for all the tunes, along with an annotated list of CDs, music books, and references for additional exploration of the Shaker muscial tradition. 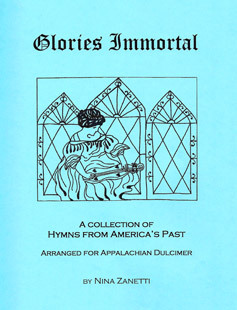 Glories Immortal: A Collection of Hymns from America’s Past contains fifty hymns arranged for Appalachian dulcimer, as well as twenty-three pages of background information on American folk hymn traditions, the history of the hymns, lyrics, and tips for playing the tunes. The collection includes samples from six different traditions of American folk hymnody: the early American “tunesmiths,” Shaker music, Moravian music, shape-note (Sacred Harp) tunes, African American spirituals, and gospel/old-timey hymns. Most of the arrangements are for intermediate level players, but a few tunes have multiple versions to accommodate different skill levels and styles. The collection includes old favorites such as “Amazing Grace,” “Simple Gifts,” "Go Tell It on the Mountain," and “Down in the Valley to Pray.” Other selections may be unfamiliar, but will introduce the player to an untapped treasure trove of lesser-known but beautiful hymns, for playing in religious settings as well as for personal enjoyment. 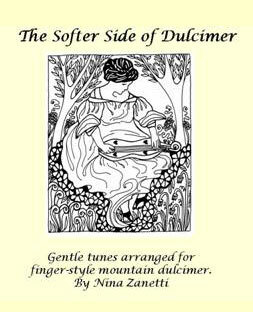 "The Softer Side of Dulcimer" is a collection of gentle tunes, arranged for finger-style dulcimer. The book contains 20 tunes. Five of the arrangements come with a second, optional variation arrangement. Helpful playing tips are included. DAD tuning. The book features fifteen common and not so common tunes arranged primarily as duets, along with some multi-level arrangements for several parts. Level: Intermediate and advanced mountain dulcimer players. Tunes include "Bonnie Doon," "Loch Lomond," "Greensleeves," "The Ash Grove," "Home Sweet Home," and more. DAD tuning. A second book of duets and multi-part arrangements by Beth Lassi and Nina Zanetti. Volume II is a collection of 19 tunes arranged primarily as duets for two mountain dulcimer players. The arrangements range from novice to intermediate in difficulty, and a few include multiple parts for players with varying levels of experience. All arrangements are in DAD tuning. The third in a series of duet books by Beth Lassi and Nina Zanetti, this collection contains 20 tunes arranged as duets or multi-part ensemble pieces for mountain dulcimer players. The arrangements range from novice to intermediate in difficulty; the multi-part ensemble arrangements include parts for players with varying levels of experience. All arrangements are in DAD tuning. Book Four in the "Tunes for Two" series includes tablature arrangements of well-loved, familiar holiday tunes as well as lesser known melodies that are sure to become new favorites. The arrangements include a mix of both secular and sacred tunes, as well as a balance between relatively easy and more challenging. All arrangements are in DAD Tuning. Duets - Lo, How A Rose E'er Blooming; O Christmas Tree; The Friendly Beasts; Up on a Housetop; We Wish You a Merry Christmas; Oh, Come Little Children; Away in a Manger (3 versions); The First Noel; Hark! The Herald Angels Sing; Go Tell It on the Mountain; Joy to the World; Carol of the Advent; What Child is This? ; Silent Night; O Holy Night. Multi-Part Arrangements - Now The Green Blade Riseth; Jolly Old St. Nicholas; Deck the Halls; O Come All Ye Faithful; Angels We Have Heard on High; Jingle Bells; Sweeter the Bells Never Ring; Ding Dong Merrily on High. 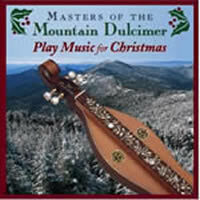 The third in a series of recordings produced by Susan Trump, "Masters of the Mountain Dulcimer, Play Music for Christmas" is a collection of some of the country's top mountain dulcimer artists performing seasonal favorites in both solo and ensemble arrangements.